Last night was a long one as we went to bed just before eight, which means by 2-00am we are awake and ready for action, all we could do was brew a cuppa, read or write. The longest Bev and I have spent in a tent is about 36 hours when we were walking in the SW wilderness of Tasmania in the Arthur Ranges and camped on the edge of Lake Promontory. It was an idyllic spot and the sky was cloudless. Around five in the afternoon a change hit and swirling clouds enveloped our camp in a matter of seconds. It started raining and continued all night and the next day and all we could do was remain in the tent and read. On the Western Arthurs walk I carried New Scientists to read and Bev, a novel. Prior to being forced to stay within the confines of the tent I limited myself to reading four pages a night, simply calculated by dividing the number of days out into the total pages in the magazine. The theory sounds simple but when confined to a tent for a day and two nights I soon ran out of reading material. 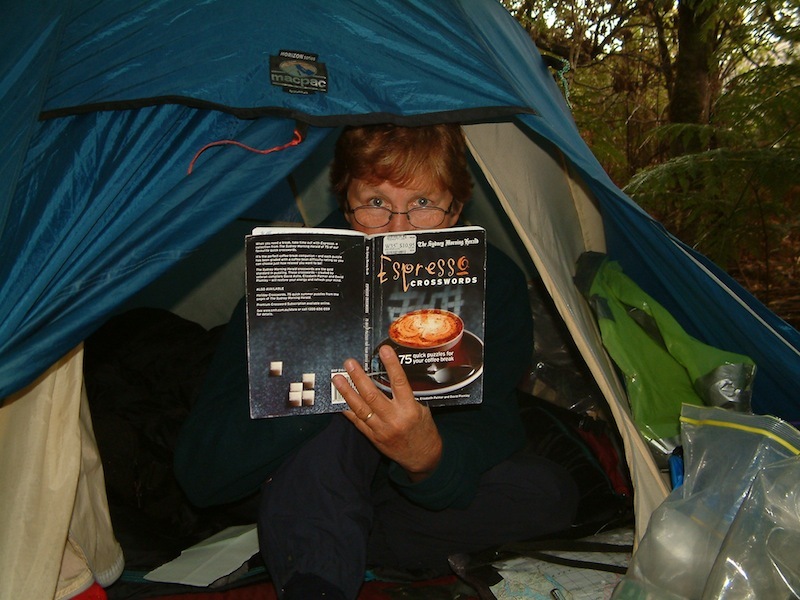 So rather than lie in the tent and play mind games like counting the squares on the inner lining of the tent Bev and I had to share her book. When she finished a page she tore it out and passed it to me. On top of the mesa the wind blew all night and at daybreak it was still full on so we decided to pull out without even having an early morning cuppa. 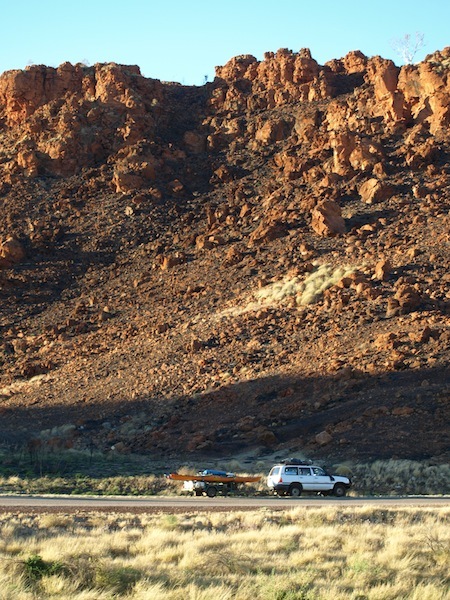 We were on the road by 6-30 and pleased we were, as soon after joining the highway we passed by the Ngumban Cliff, (a gap in the ranges) and being so early we caught the best light for photographs. The amazing thing about the cliff is it is located on a distinct geological joint line where limestone meets hornfels. The hornfels side of the joint line. The limestone side of the joint line. 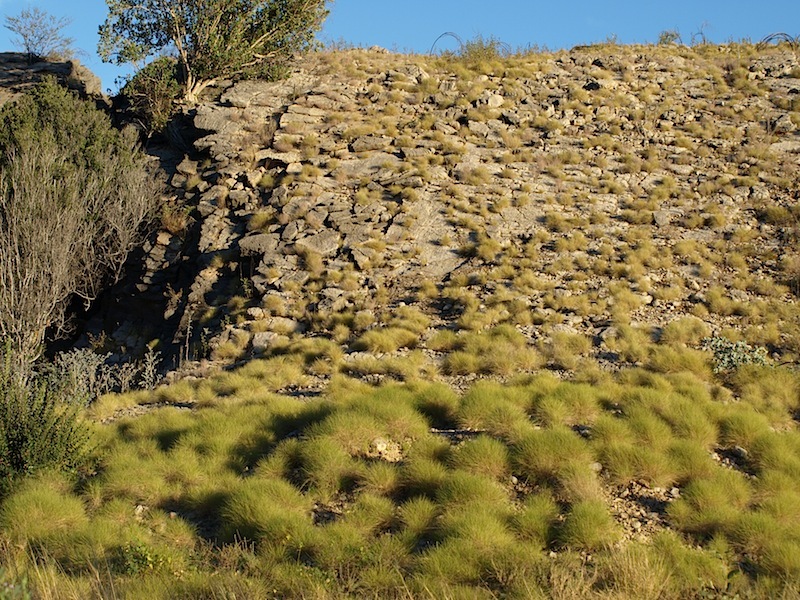 A geological theme for the day was set because as we continued towards Fitzroy Crossing there were limestone jumpups, the likes we have only seen around Riversleigh Fossil site to the north of Mt Isa or around Chillagoe in far north Queensland. No free camp tonight mainly because the road was fenced along the edge on both sides. Forced to go into a roadhouse caravan park. 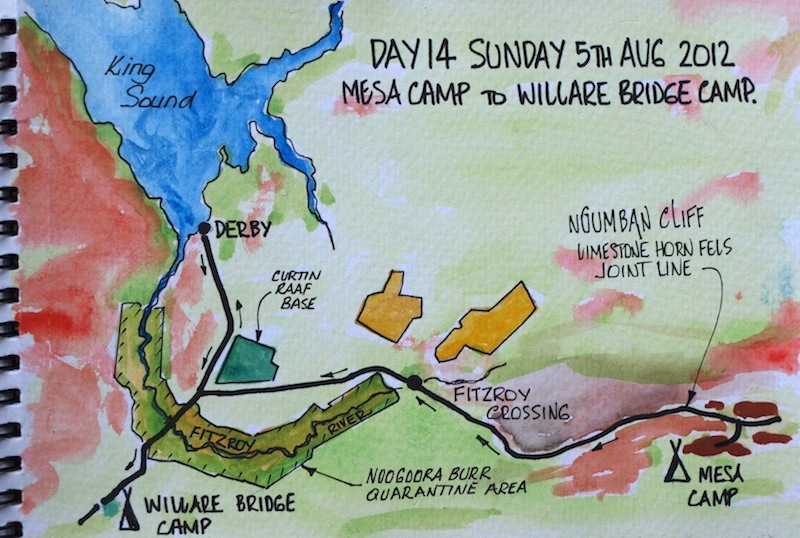 The camp last night at Willare Bridge was rather novel. Travellers parked their vehicles in a circle, pointing in as if they were parked around a football field. The grass was green, something in short supply up these parts. In the dry, like now, most grass if it is not mown and tended is long and dry. 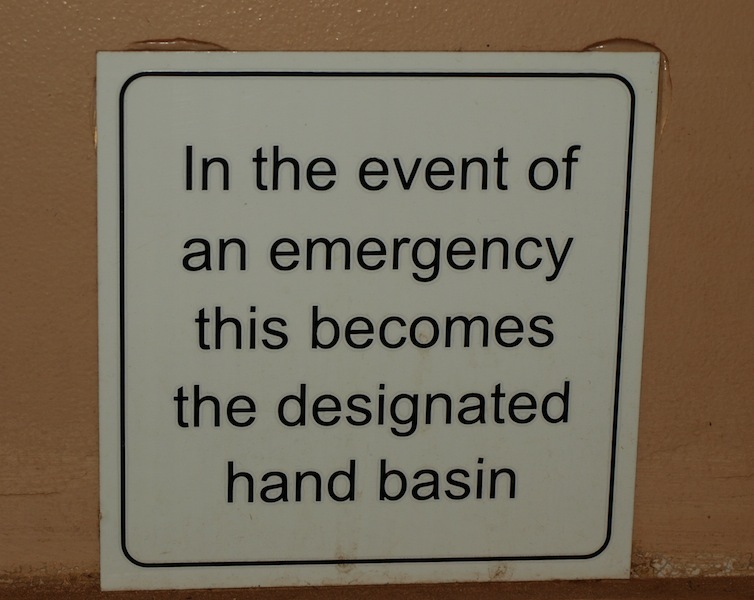 It wasn’t a bad camp except to say the ablutions block was a bit grubby. The tree here is a Helicopter tree (Gyrocarpus americanus) so- called because the seeds when they fall gyrate like a helicopter rotor. I don’t know what this bloke’s name is. I sometimes wonder when I spot an insect like this whether it is a new species. This visitor landed on the towel draped over the kayak. I think I am getting to know how to use the macro attachment for my camera. This shot was taken with the ISO set at 800 1/125 sec @f22. 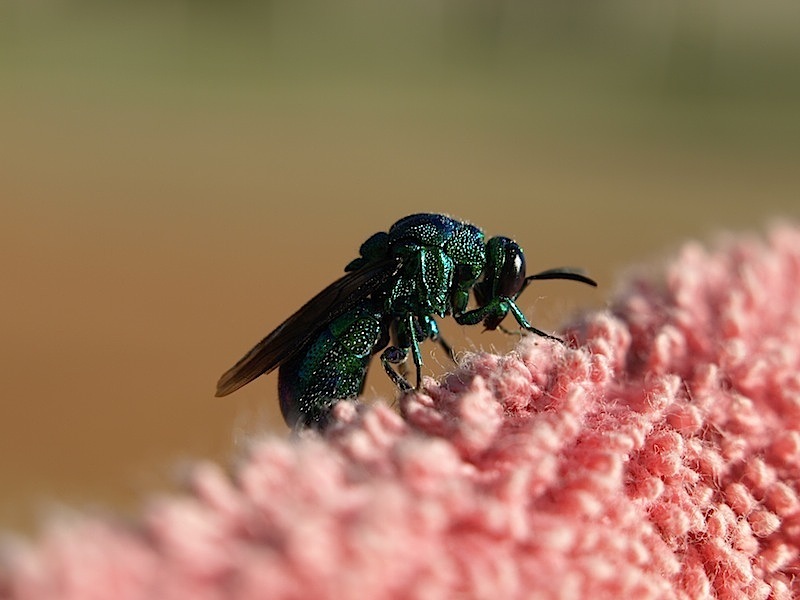 I include this information as I know there are readers of this blog getting interested in macro photography. O H & S gone mad???? 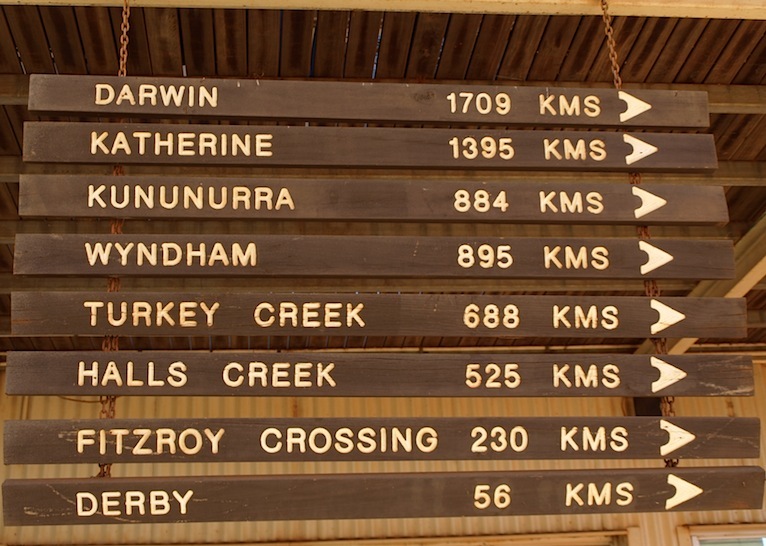 Following are a couple of fingerboard signs of note for overseas readers who have difficulty in accepting the vast distances we travel in Australia. To the north from whence we came. Noxious weed sign at the Willare Bridge. 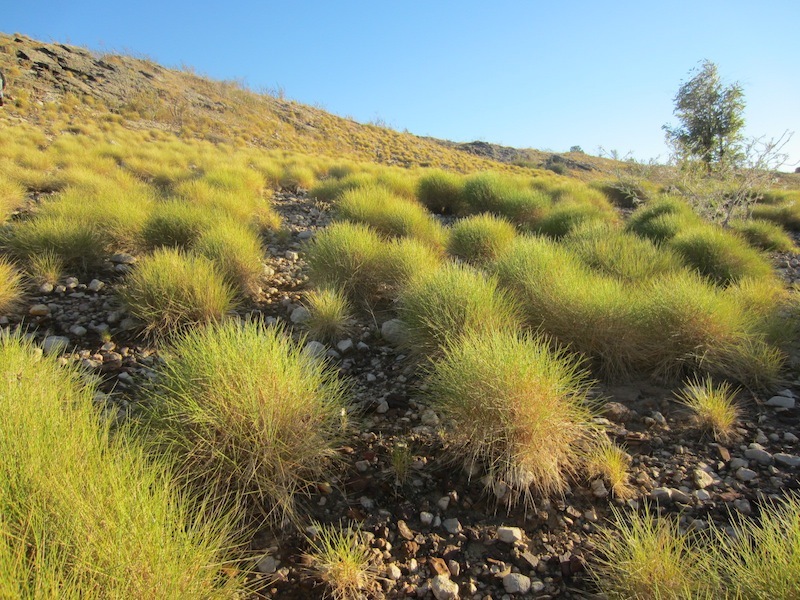 In western NSW Noogoora burr is a common weed, in fact it was said that the Macquarie Marshes (Day 1 Leg 1 of our Odyssey) was the home of the wild pig and Noogoora burr. 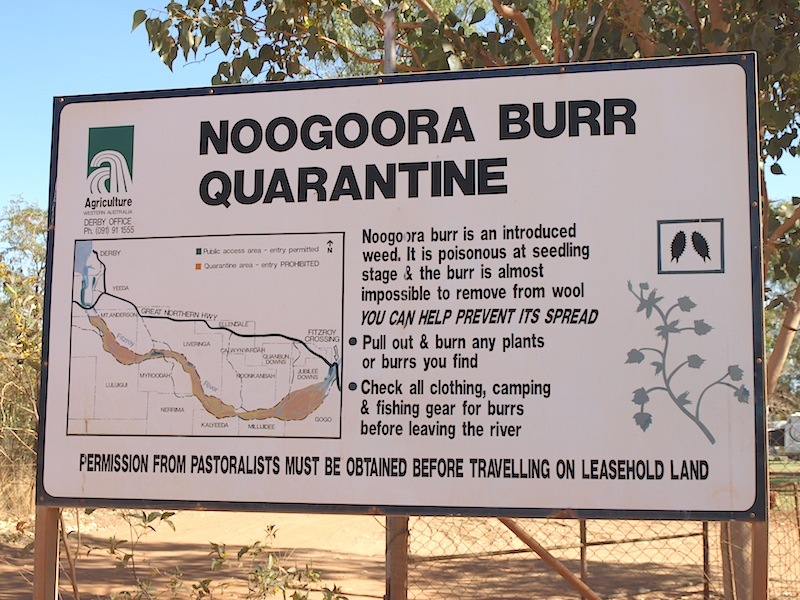 The burr is much like the hook half of Velcro and some people believe the idea for Velcro came from the Australian Noogoora burr but this was not the case. It was invented in 1941 by Swiss engineer, George de Mestral, after returning from a hunting trip with his dog. The dog was covered with burrs and when looking at them under a microscope, he noted the burrs had hundreds of “hooks” that caught on anything with a loop, such as clothing, animal fur or hair. He saw the possibility of binding two materials reversibly in a simple fashion. The problem was how to duplicate the hooks and loops. The copying of nature’s mechanisms is called bionics or bionimesis. George’s invention wasn’t taken seriously until it was used on astronauts’ space suits. The patent ran out in 1978 then manufacturers all over the world made and promoted the product. 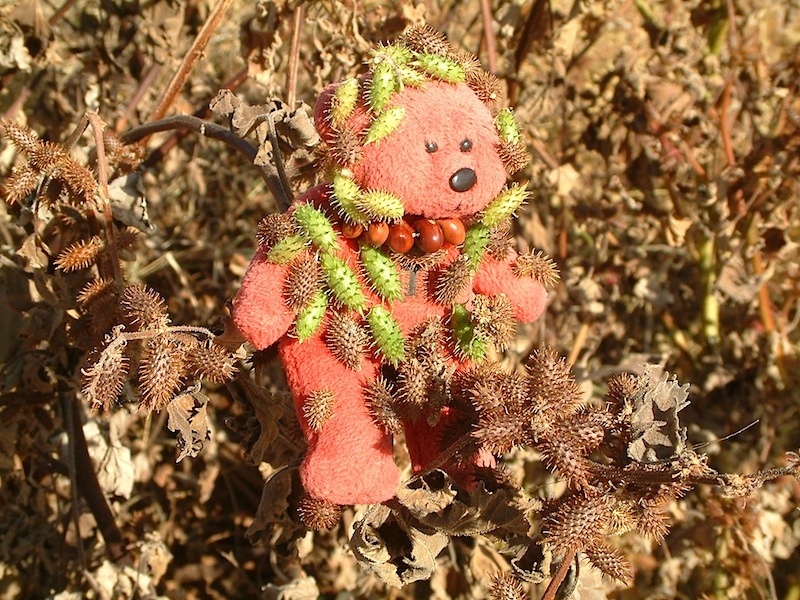 T Bear in trouble in a patch of Noogoora burr. 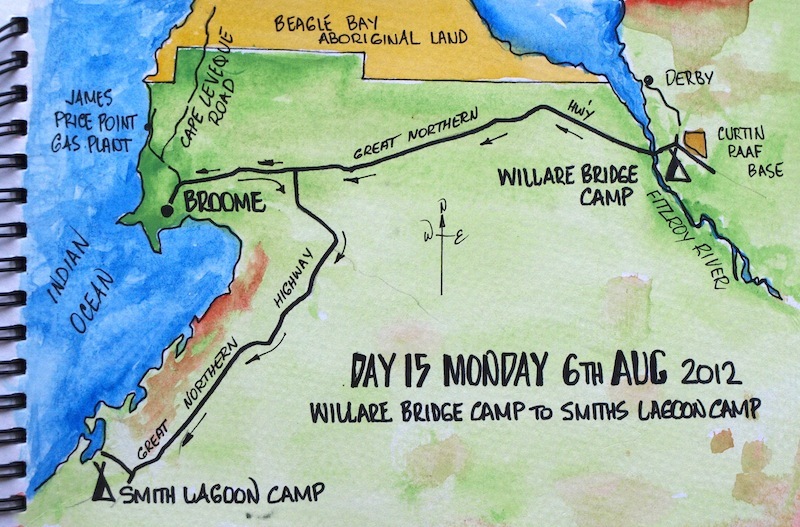 From the Willaire Bridge camp we headed for Broome. 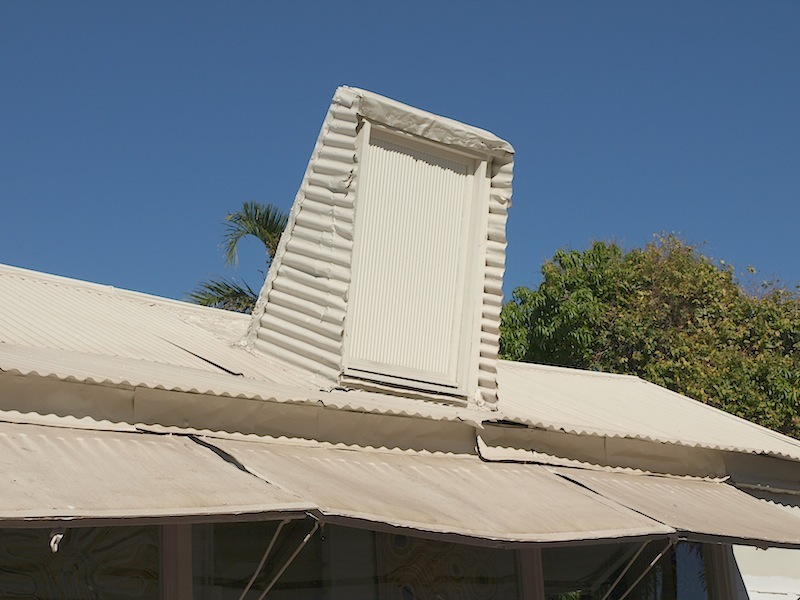 The last time I was in Broome was in 1970 and at that time it could be only be described as a sleepy settlement. 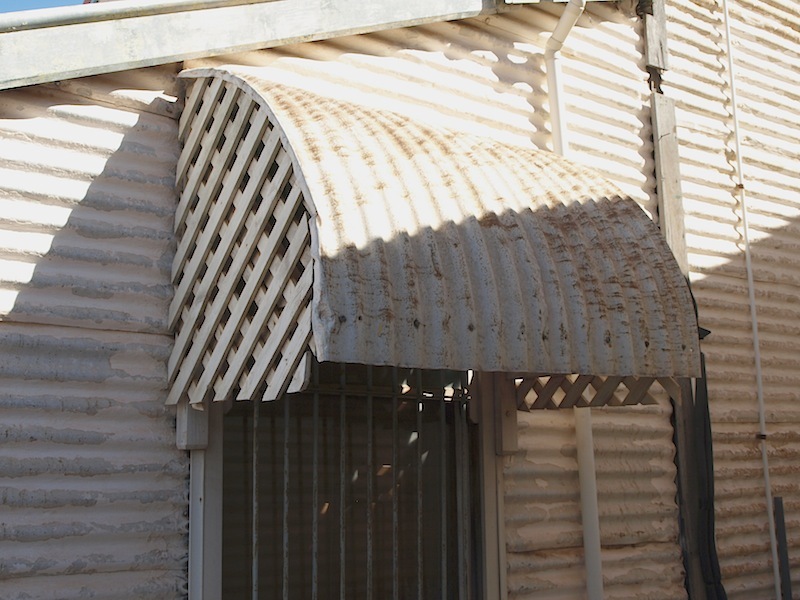 The only buildings then were colonial style corrugated iron houses and shops centred around Chinatown. Today it is a very different matter. When approaching a town that I haven’t been to before or visited in a long time I muse over what it might be like with the advance of progress. Approaching Broome the billboards with the big real estate franchise names appeared telling me the developers had moved in and I wasn’t going to like the town much in its new form. Now four lane divided roads cut through the colourbond estates and industrial areas and out at Cable Beach you are herded into parking bays, you would think you were on the Gold Coast of Queensland. I don’t mean to offend those who live on the Gold Coast, I mention it as a form of comparison. Today we were hard pressed to find any of the old Chinatown buildings, the only vestiges of the ‘good old days’ was at the back of the main street. This contraption caught the breeze and funnelled it down into the room below. Unfortunately it seems to be no longer used as it is sealed up. 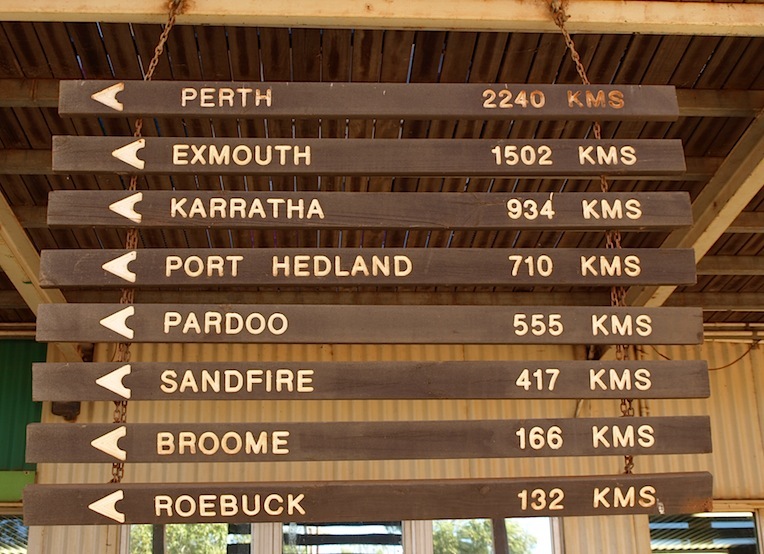 For old time’s sake we went to Broome port and walked out the kilometre long wharf. 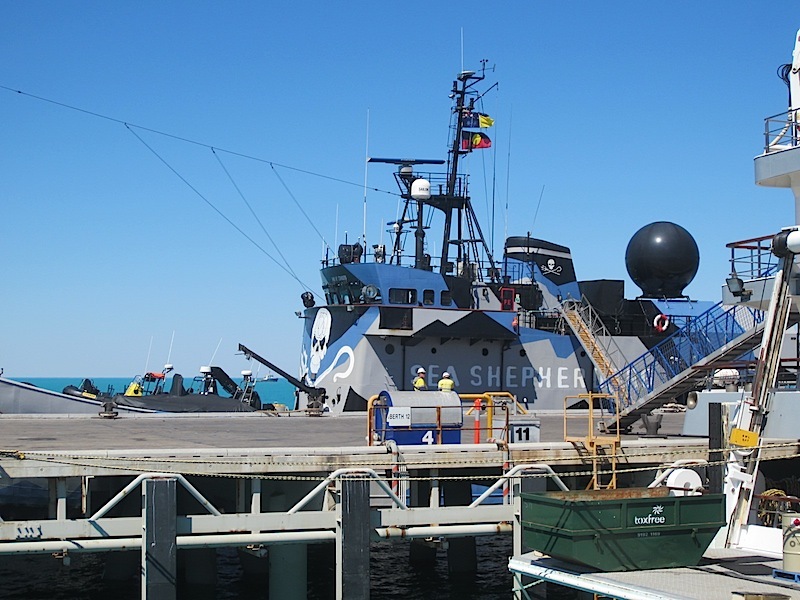 At the end was the Sea Shepherd ship, the Steve Irwin. It seemed out of place here in the tropics, it’s usually down in the Southern Ocean protecting whales from Japanese whaling vessels. It turns out it is in town because scientists on board are carrying out a whale count off James Price Point where a consortium want to build a 30 billion dollar gas loading facility. The majority of local Jabber Jabber people do not want the development to go ahead but I doubt if their views will matter as there is big money coming the government’s way if it proceeds. Bob Brown was on the Sea Shepherd today. He is attempting to make the locals who want the development to go ahead aware of the effect in having large vessels plying the pristine waters of the area. Unfortunately I doubt if Bob boy will have any effect on the thinking of those pro the development because money talks. James Price Point is one of the most spectacular parts of the WA coast. We did intend going kayaking up those parts but decided against it because if I were to see how beautiful it was before the development I would grieve when seeing images of the development as construction proceeds. In cases like this I think only of the littleness of man. 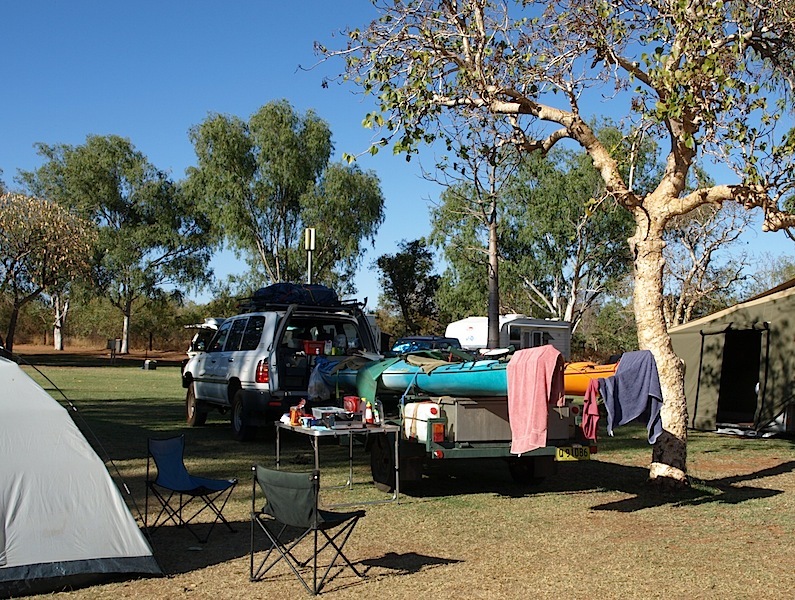 It’s hard to find a shady spot in Broome for car and trailer but we did down by a creek. Bev wanted to post a blog so I wandered about. A taxi arrived and an indigenous family got out and disappeared into the mangroves. I thought it strange catching a taxi to your favourite fishing spot. I spoke with a young couple from New York City as they reorganised their campervan and I found an old boat yard where wooden boats were built. All the machinery such as planers, thicknesser, bandsaw and circular saws were abandoned and rusted. I wish I had seen the operation in its heyday. 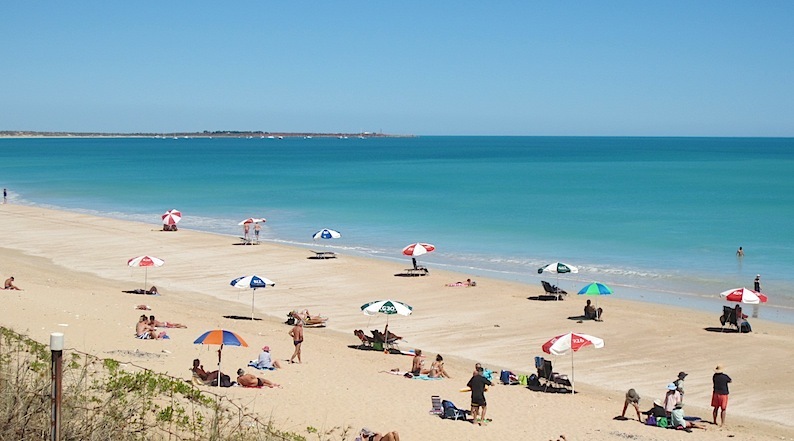 Because Broome is ultra-touristic and commercial we decided to push on to a less hectic place. We turned south and not north, knowing full well we would be in for some criticism from friends and family for not going north to Cape Leveque but from all reports the whole peninsula was full of backpackers and grey nomads. A couple of hundred kilometres down the coast we discovered Port Smith Caravan Park, adjacent to a lagoon. We arrived in the dark and ready for a cup of tea and a good lie down (I have a wog I feel generally like the stuff dung beetles deal with), but it was not to be as two rear tyres on the car were going down so I put a jack under the most deflated one after deciding to fix it tomorrow. Looking forward to finding the lagoon tomorrow.